Saturn's Dark Side - Solar System Planets And Moons Section. Dark Side of Saturn's Rings. 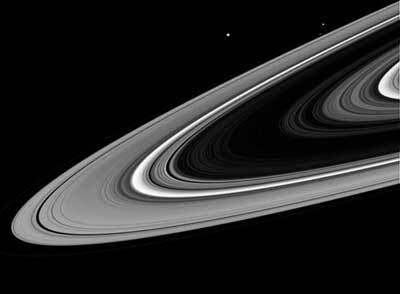 Saturn's rings on October 27. Cassini took this image of Saturn's rings on October 27 as it swung past the dark side of the planet during its first close pass after it arrived. The image also contains three of Saturn's moons: Mimas, Janus, and Prometheus. Although it's normally quite bright, the B ring looks dark from this side, when it's not being illuminated directly by the Sun. As Cassini swung around to the dark side of the planet during its first close passage after orbit insertion, the intrepid spacecraft spied three ring moons whizzing around the planet. Visible in this image are: Mimas (398 kilometers, or 247 miles across) brightest and above center; Janus (181 kilometers, or 112 miles across) second brightest at upper left; and Prometheus (102 kilometers, or 63 miles across) just above the main rings at upper left. The normally bright B ring appears very dark from this vantage point. Regions with smaller concentrations of particles, such as the Cassini division (bright near center) transmit more sunlight and thus are brighter. The image was taken in visible light with the Cassini spacecraft wide angle camera on Oct. 27, 2004, at a distance of 757,000 kilometers (470,000miles) from Saturn. The image scale is about 42 kilometers (26 miles) per pixel.